When schools and families form one, cohesive community, we can raise our children together. We can lean on each other and share our expertise. 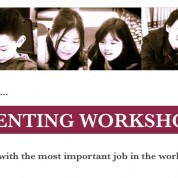 This parenting workshop represents my values and research as an educator who cares deeply about the wellbeing of every family in my school.